Who doesn’t love a good slaw? 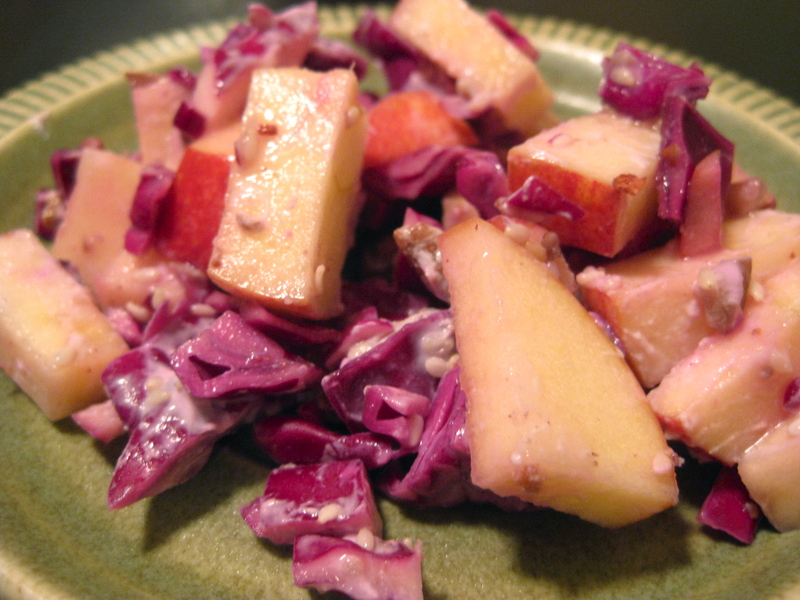 Beautiful purple cabbages and red apples combine to make a bright dish during dreary winter days. I combined 1/2 a head of cabbage, sliced and diced with an apple chopped bite size. No tried and true recipe here, but into the mix went a bit of champagne vinegar, a bit of plain yogurt, and some chopped pecans. I added some sesame seeds that were lurking in my cabinet, along with a little salt and just a pinch of sugar. Then I covered my bowl of cabbage-y, apple-y deliciousness and let it sit in the fridge overnight. The purple color of the cabbage infused the whole dish, turning the thin yogurt sauce a beautiful shade, and slightly coloring the apples. 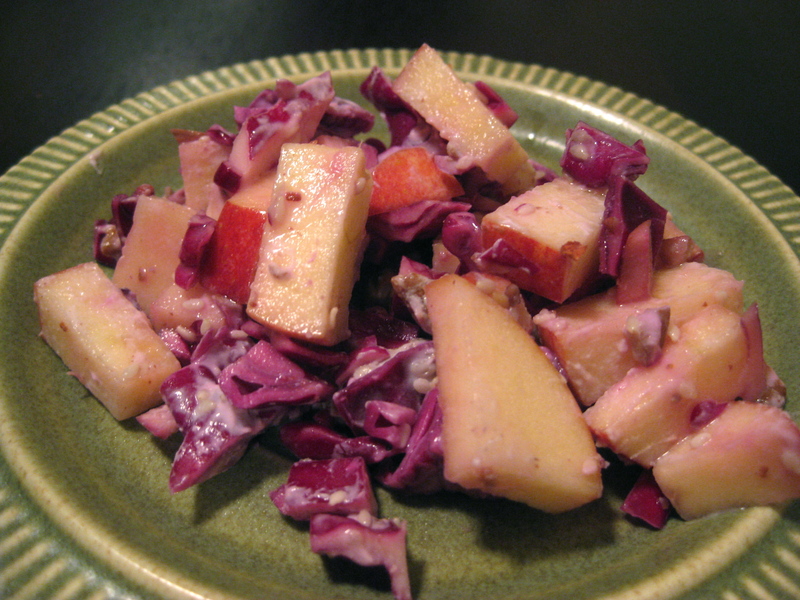 The vinegar in the dish kept the yellow flesh of the apples from browning, and their red peels provide a nice contrast to the purple cabbage. Crunchy, colorful, sweet and sour. Slightly creamy, but mostly tangy. Delightful as a side dish, or tasty as a sandwich topper. You can’t go wrong with a good coleslaw. 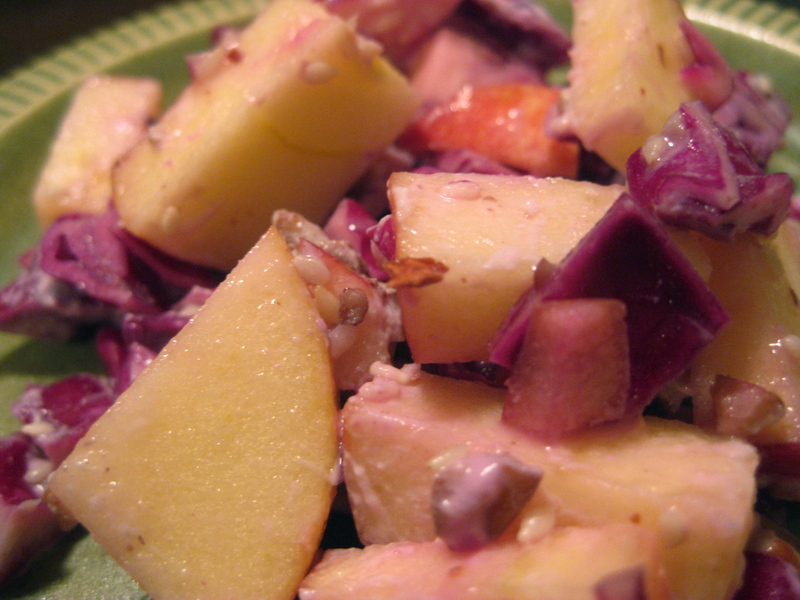 This entry was posted in In the Kitchen (recipes & more) and tagged apples, cabbage, coleslaw, local food, seasonal food, seattle, side dishes, slaw. Bookmark the permalink.